Wivenhoe House is a magnificent Grade II listed country house hotel surrounded by sensational parkland. 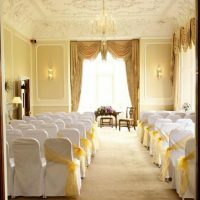 With a long history reaching back to 1759, the four-star luxury hotel makes a unique setting for weddings and civil ceremonies. Following a sensitive restoration, the hotel offers a fusion of traditional features and modern facilities and comforts. 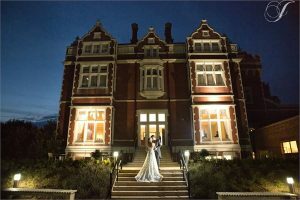 The magnificent spiral staircase, elegant décor and landscaped gardens provide a visual spectacle that is ideal as backdrops for your photographs. 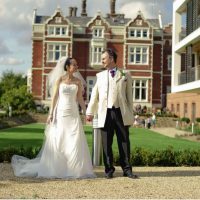 Exclusively yours, Wivenhoe House only hosts one wedding a day ensuring you receive exceptional service from the dedicated wedding team. Offering a choice of settings for your memorable day, you can hold your celebrations in the main house drawing room or Signatures Room. Alternatively, make use of the versatile rooms in the Garden Suite which is set in the contemporary wing. Mix and match to make the most of these three unique and beautiful spaces. Accommodating up to 80 seated guests, the drawing room is elegantly furnished and features large bay windows overlooking the grounds. The ornate ceiling, romantic chandelier lighting and neutral décor create a warm, inviting ambiance for your memorable day. Adjacent to the drawing room you find the Signatures Lounge. Traditionally decorated in period style, the room features high ceilings, this intimate setting is ideally suited to more intimate gatherings. Accommodating up to 60 guests for reception drinks or 30 guests for a wedding breakfast. 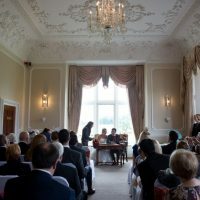 Comprised of three interconnecting rooms, the Garden Suite is the most versatile setting accommodating up to 110 seated guests or 150 reception guests. Because of the movable partition walls, you can use the space in a variety of configurations to suit your needs. 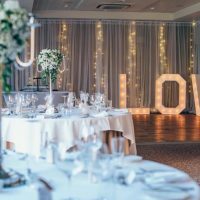 In addition to the three set packages, the wedding team are also happy to tailor packages that are unique to you and your requirements. There are also last minute and special seasonal packages, all of which provide a stress-free approach to planning the big day. Using the freshest ingredients, the creative catering team strive to exceed your expectations with a wide choice of sublime delicacies. Whether you fancy a light buffet, summery barbeque, hog roast or three-course meal, there are options to suit all. Please contact the wedding team to enquire about special dietary requirements. Choose from over 40 luxuriously appointed rooms to enjoy a relaxing stay. The magnificent house hosts sixteen rooms and suites while the garden wing accommodates an additional twenty-four rooms and suites. For further information please call 01206 863 666 or take advantage of the online enquiry form.